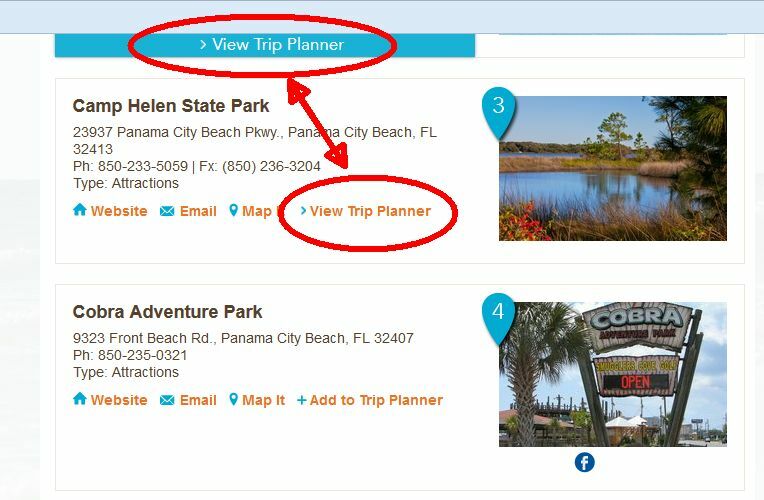 The new Panama City Beach CVB website offers a ton of new features to help you plan your trip to PCB, enjoy your time here, or just daydream about being at the beach while you&apos;re stuck in the office! First off, make sure you check out the new Trip Planner. I hate to plan my free time, but this tool is super helpful, and is actually kind of fun, too. Plus, you can email or print off your itinerary, so you&apos;ll have the phone numbers and addresses of the places you want to go. Here&apos;s how it works: When you&apos;re looking under "Things to Do," "Places to Stay," or "Restaurants" (all of which are major tabs at the top of the page), find a listing you&apos;re interested in and click "+add to trip planner". You can choose as many activities as you want, and a blue button will pop up that says ">View Trip Planner". Click on that, and it&apos;ll take you to your itinerary, with everything you&apos;ve chosen listed for you on the left. Then, you just drag it to whatever day you want to do that, and you&apos;re on your way to building your itinerary. From there, it&apos;s easy to print it or email it, and it&apos;ll help you make sure you have all the time you need to do all the things you want to do. My next favorite thing is the expanded "Beaches" section. 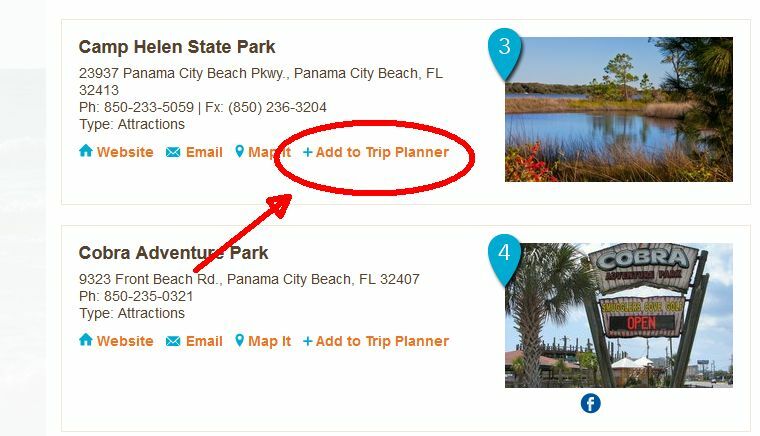 Click on that tab at the top, and you&apos;ll find great information on the most popular beaches and state parks in Panama City Beach, plus a guide to the fishing piers, the beach access points, and even local dive sites (complete with latitude and longitude points). For daydreamers, the Beach Webcams are a great way to see exactly what&apos;s going on at specific area beaches in real time. Another good feature that will help plan your trip is the "Compare" option for the different condos, hotels, and accommodations. Under the "Places to Stay" tab, find the accommodation listings, then click "Compare" by each one you&apos;re interested in. After you&apos;ve selected two or three, select "Click to Compare" and you&apos;ll see which amenities each selection offers. 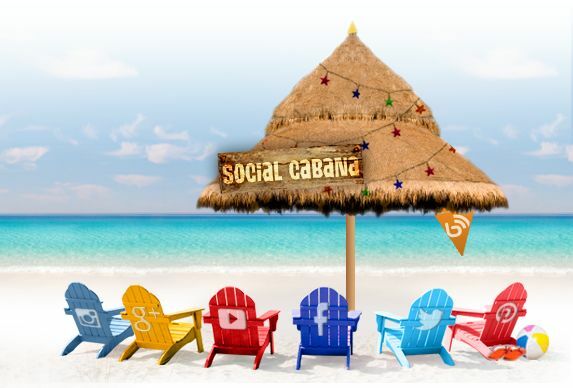 Don&apos;t miss our "Social Cabana," either, where you can find easy access to our social media sites like Facebook, Twitter, YouTube, or Pinterest - In fact, you can pin any of the photos from our page onto Pinterest just by holder your curser over the photo and then selecting the "Pin it" feature that pops up. And if you have any questions, a new "Live Chat" features is available a the top of each page, so you can chat online with a PCB representative during normal business hours (8 - 5, CST). So have fun, enjoy the new website, but most importantly, come on down to the beach!